Traditionally, a wide variety of terms and definitions have been used to describe various developmental defects of enamel (DDE). However, this original index turned out to be too complicated to use in practice and a modified DDE index (mDDE) was presented by FDI (1992). 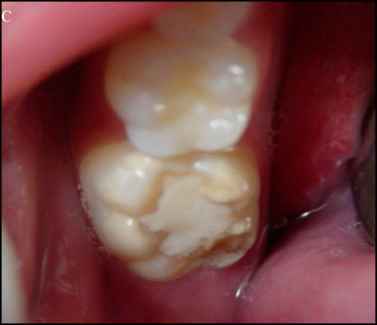 The modified development dental enamel (DDE) index was considered to be too time consuming and not adequate for MIH prevalence studies because the post-eruptive breakdown is a pathognomonic feature in MIH but the mDDE index does not clearly distingue PEB from enamel hypoplasia. According to European Academy of Pediatric Dentistry seminar (EAPD) placed in Athens in 2003. (Weerheijmet al., 2003) The diagnose of MIH must be based on scores range from 0 to 10 (Table 2). (Ghanim et al., 2011) The screening of MIH must be done in children eight years of age; examination for MIH should be performed on wet teeth after removing debris with cotton roll; first permanent molars and incisors should be examined, each tooth as seen in Table 2. Table 2. Criteria for scoring molar incisor hypomineralisation (MIH) according to European Academy of Paediatric Dentistry recommendations cited by GHANIM et al., 2011 (Ghanim et al., 2011). Clinically, the enamel defects can vary from white, cream, yellow to brownish, but they always show a sharp demarcation between the affected and sound enamel. The tooth surface enamel initially develops to a normal thickness, but can chip off under masticatory forces called post eruption breakdown (PEB) (Figure 2B) PEB is characterized by poor aesthetic appearance and sensitivity to thermal and mechanical stimuli. After such PEB, the clinical pictures can resemble enamel hypoplasia. However, the margins of the disintegrated areas are irregular, whereas those in hypoplasia are smooth and rounded. 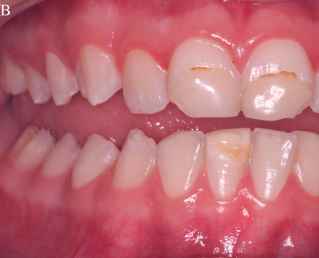 The demarcated lesions in MIH should also be distinguished from the diffuse opacities typical of fluorosis. Dentitions with generalized opacities present on all teeth such as in Amelogenesis Imperfecta, rather than limited to the first permanent molars and incisors, are not considered to have MIH. Nowadays, to simplify the use of MIH scores, the severity of MIH can be determined by dividing the affected teeth in only two groups: mild defect (demarcated opacities) (Figures 4A, B) and moderate/severe defect (enamel breakdown and atypical restorations) (Lygidakis et al., 2008) (Figures 4B, C ). Fig. 4. A to C - Mild defect opacities in right FPM (A). Atypical restorations in upper incisors (B) and in left lower FPM (C). Note the opacities in the vestibular surface of the right lower incisor (B), left upper FPM (B). Post restoration enamel fracture in lower right FPM (C). 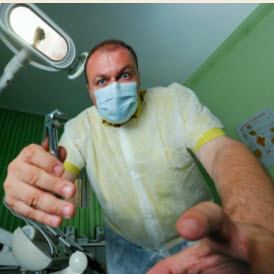 Dental diseases have a detrimental effect on quality of life both in childhood and older age. (Moynihan & Petersen, 2004) Several authors have discussed whether developmental defects of enamel (DDE) are a public health problem. (Mathu-Muju & Wright, 2006) For a condition to be considered of public health significance, several criteria need to be reviewed, particularly the prevalence its impact on an individual in terms of symptoms, functioning, psychological and social should be considerate. (Marshman et al., 2009) Besides its clinical implications in the field of public health, MIH have taken on importance as strong predictors of dental caries. This result highlights the importance of establishing priority programs of prevention and early treatment for these groups of children both for aesthetic and functional reasons, as well as to minimize the increased risk of dental caries.